Gdańsk, Mariacka Street. The world capital of amber. 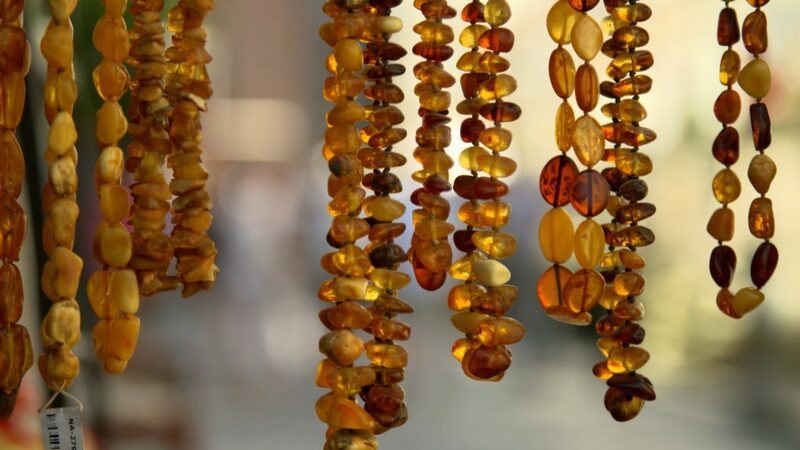 Windows of stores and stalls are groaning with amber jewellery. Tourists, mainly foreigners, wander about searching for elegant earrings, pendants and bracelets. After all, Gdańsk amber jewellers are famous all over the world. A few kilometres away, in a small shopping mall, Olga and Ivan run a jewellery store. Besides jewellery, they also sell raw amber. Straight from Ukraine. “This one costs 150 zlotys. That one 200. I can reduce the price for large volumes” says Olga, reaching for bags with amber hidden under the counter. A dealer from Szczecin enters the store. He has an appointment with Ivan. When they realize we are listening in on their conversation, they go outside to seal the deal. In the meantime, we haggle with Olga. “How much for the fatter one?” we ask. “700 zlotys per kilo. No papers for these either. Ivan brought them” Olga replies. “Where do you bring them from?” we want to know. “Ukraine” says the lady. Ivan and Olga can bring bigger amounts in two weeks. “We can bring anything for you” says Ivan. “Without papers?” we ask. “No papers” confirms Olga. “There are no papers in Ukraine” adds Ivan. “Papers” are mining licenses and documents to legalize amber in Poland. Everything seems to indicate that the amber offered by Olga and Ivan has been smuggled. “Polish amber has a 10 to maximum 15 percent share in the market. Everything else is contraband” says an informer involved in smuggling from across the eastern border. Before he started smuggling amber, he smuggled cigarettes and alcohol. How much amber enters Poland every year? “By my calculations, some 60-70 tons – no less than that. A lot of merchandise, a lot of money” says the smuggler. His estimates are confirmed by amber dealers with many years of experience in the business. According to our sources, even 200 kilograms of amber can be illegally imported into Poland every day. Ukraine has some of the richest amber deposits in the world. They are most abundant in the north-western part of the country, oblasts Volyn, Rivne and Zhytomir. Besides Poland and Ukraine, amber is also found in Russia, Lithuania, Latvia, Estonia and Belarus. But it is Ukraine that is the main supplier of the raw material to Poland. At the beginning, the Ukrainians would dig that 40-million-year old fossilized resin with shovels. Not knowing what it can be used for, they often used amber as fuel. But a few years ago Poles came to Ukraine and showed locals how to mine for the valuable resin faster, using motor pumps which they made with engines from Mercedes cars imported from Poland. It soon turned out that mining and selling amber generates a lot of money. Oleksandr Vasilyev lives in Klesów, in the west of Ukraine. He is an ex amber digger, today a local politician. “I started digging for amber because I had to support my family. My wife worked as a teacher then. We lived in a straw hut. I wanted to build a house for us. Who wouldn’t want to live a better life? Everyone wants it. I had no other choice. That’s how I got into the business. Like everyone in our parts” says Vasilyev. Forests in western Ukraine are strewn with hundreds of places where amber is mined illegally. Why is this business so profitable? “A kilogram of 50-gram ambers costs 5,000 dollars. It is the equivalent of the statistical annual family income in this region of Ukraine” says Sasha Nikolaychuk, a city councillor from Olevsk. The amber fever breaks out at the time when Euromaidan is happening in Kiev. The revolution and war in the east of Ukraine led to anarchy in the region where amber is mined. It is at that time that digging became widespread and extremely profitable. And it got out of control of the Ukrainian authorities, which had more serious worries than illegal mining. “The trouble started when the bandits came. They bought in amber and organized the mining. They said they would organize mines for us and that no one would be disturbing. We had to pay them a sum for protection and being able to work in peace. They had connections. We had to pay them well” says Vasilyev, a digger with many years of experience. To dig, you have to pay the mafia – the protection money ranges from 300 to even 1,000 dollars a day for one pump. The amount grows with the richness of the deposit. The mafia charges several hundred dollars just to enter the dig. Mobsters share their profits with corrupt policemen, local politicians, prosecutors and even special services. 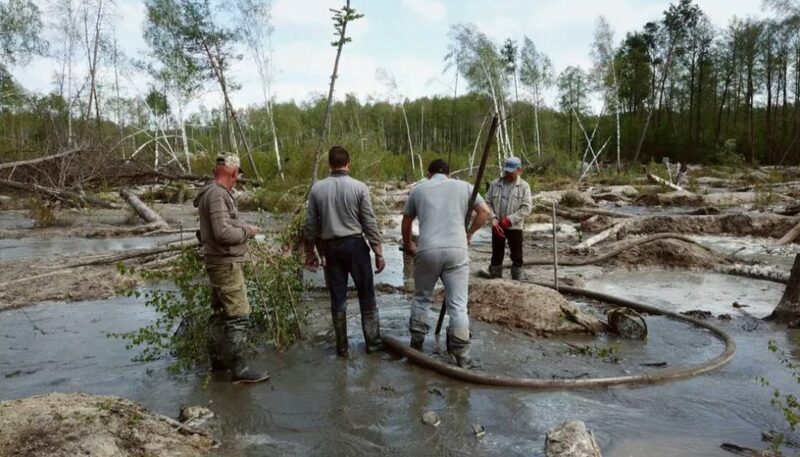 “There are people in the authorities in Kiev that control the illegal amber mining. Although, believe me, it could all be legalized in a few weeks right away. The authorities in Kiev know exactly what is going on in our region. But the money is flowing to them. The authorities are not interested in changing things. If there is amber, they are not going legalize it. 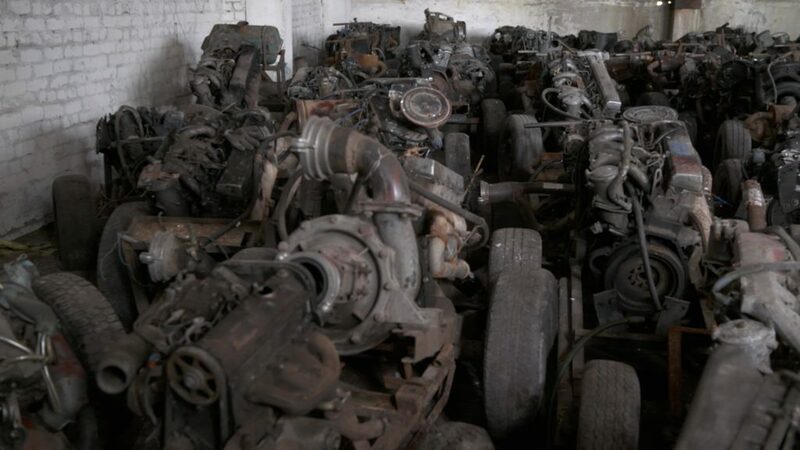 You need to understand that these are millions of dollars a week” says Sasha, the Olevsk councillor. Ukrainians are well aware of the illegal extraction of amber in the west of the country. Few Ukrainian journalists decide to reveal who stands behind the amber business. 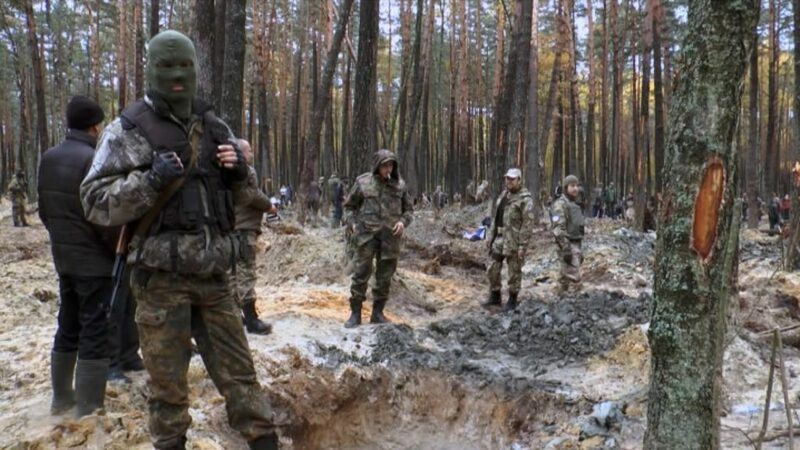 „The biggest dig I’ve been to – and I have an exclusive video from there as I was the only journalist not afraid to go – was on 2 hectares of forest. There were 20,000 people there. The police did not go there because they were afraid” says Dima. He adds that, on top of threats, security guards hired by the mafia attempted to bribe him. “A mafia man approached me once and said: ‘See that new Range Rover over there? It’s yours but you have to give us your camera with what you recorded today’” recalls the journalist. Sasha, the Olevsk councillor, tried to give publicity to the problem of illegal amber mining when he was still a journalist. He was assaulted by bandits. “Who were those people? They were athletes engaged in assaults and muggings for the mafia” says the councillor. Also Vasilyev, a local politician who wanted to fight illegal mining, suffered from the anger of the mafia. “They threw a grenade into my home. They wanted to silence me in this way. The police did not find the perpetrators” he recalls. Special police groups fight illegal mining. Major Volodymyr Korkosh leads one of them. He shows us a warehouse where motor pumps are stored. “We requisitioned these over the last four or five years. We have a similar warehouse in every region. Mining production was highest in 2014. At that time, all police forces were directed to Kiev, for the Euromaidan. Nobody supervised amber deposits. Locals make money from illegal amber mining and don’t pay taxes” says the major. March 2016. Night. A bridge at the border crossing in Dorohusk. Paweł G., the driver of a Polish truck loaded with pellet fuel, is joined by Vasil G. At customs clearance, the Polish driver declares that he is carrying pellet fuel. Customs officers scrupulously check the trailer. Besides pellet fuel, they find bags with amber hidden on pallets. From the case file of the largest smuggling uncovered by the Polish customs services it appears that the smugglers tried to bring in one and a half tons of amber, worth 24 million zlotys. Before customs officers discover the illegal goods, Vasyl G. says that the truck is overloaded. A delivery van is waiting in reserve, onto which excess baggage is loaded. Paweł G. had no idea he was carrying amber. In his testimony, he only mentions an additional night loading in Kaunas, which is when he suspects Ukrainian smugglers added bags of amber to the pellets. Vasyl G. is prepared that customs officers may discover the amber. He shows them invoices saying that the amber in the Polish truck comes from Moldova. And it has been purchased by a client from Hong Kong. The cargo has to be delivered to the airport in Warsaw – from there, it is supposed to fly to the Far East. The customs officers do not trust the documents and the case is referred to a prosecutor. At the trial, defence counsels of Vasil G., suspected of smuggling, submit to court more invoices confirming the transaction between a Moldovan company and a Chinese citizen, legalizing the origin of the amber. The court finally believed them and acquitted the smugglers. And although the prosecutor’s office appealed against the verdict to the Supreme Court, the amber had already left Poland. Customs officers handed the merchandise over to a representative of the Chinese citizen and, in the end, the amber was loaded onto a plane flying to Hong Kong. Customs officers found 1.5 tonnes of amber in a Polish truck. This is just one of many ways of legalizing Ukrainian amber in Poland and branding it “Made in Poland”. Most of it enters the market without any permits or waybills. Our informer took part in the Dorohusk operation. It turned out that the intercepted transport was just a cover. When the customs officers were dealing with the truck they stopped, the mafia smuggled a much bigger load. “Customs were tipped off about this shipment. But a moment later 16.5 tons passed across” says our informer. Large amounts of amber are smuggled in many ways: hidden in cars, trucks, even in rubber dinghies flowing across border rivers. A high-ranking member of the amber mafia, whom we have persuaded to talk about the amber business in Ukraine, is enigmatic: “I’ll tell you what, there are some people in our country and there are some in yours. Corruption is everywhere”. His account is confirmed by an underworld informer who is active on the Polish side of the border. “Everyone on the border is corrupt” he says. Officially, there is no amber mining in Poland. Nobody knows how much amber there is on the market and how much jewellery is made in Gdańsk – even the Polish Amber Chamber of Commerce does not keep any statistics. 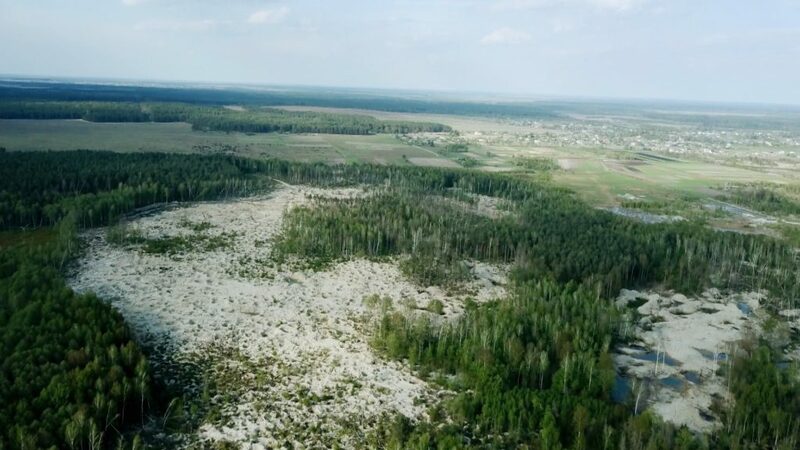 However, the last mining license for this raw material in Poland expired in January. And even though the International Amber Association in Poland says the industry sources amber primarily from the Polish coast of the Baltic Sea and Lithuania, the scale of smuggling contradicts this. This is evidenced by data quoted by Vice-Minister of Environment and Chief National Geologist Mariusz Orion-Jędrysek. At the Regional Consultative Conference on raw materials policy in April, he said: “Amber is our national treasure. Unfortunately, according to the Ministry’s estimates, only about 0.6 tons of amber, out of approximately 10 tons on the market every year, have been sourced legally”. The Vice-Minister relies on the calculations of the National Tax Administration, which has added up the quantities of amber intercepted by customs officers last year. But the officials are missing the actual volume of contraband which people working in the smuggling industry estimate at up to several dozen tons per year. And the demand for the precious raw material is not falling. Amber products are the pride of Gdańsk and the showcase of Poland around the world. Amber ornaments are worn by music stars and celebrities. During their stay in Poland, Duchess Kate and Prince William were presented with amber jewellery as a gift from the municipality of Gdańsk. The amber from which it was made most probably did not come from the Baltic Sea. It was smuggled in. The article has been written by Jakub Stachowiak, Patryk Szczepaniak (TVN Superwizjer), Konrad Szczygieł (OKO.press) in cooperation with Anastasiia Moroz and Jurij Opoka from the Reporters Foundation. The full broadcast of the TV report (in Polish), is available on Superwizjer’s website. Ukrainian journalist, since 2017 working at the Fundacja Reporterów (Reporters Foundation). Based in Warsaw. Polish journalist, reporter at oko.press, since 2016 working with Fundacja Reporterów (Reporters Foundation). Based in Warsaw.